Rocksteady returns to bring the ‘Arkham’ series to a glorious close with a perfect blend of old and new. For the past six years, the Arkham series has been a bright spot in the otherwise dim genre of superhero video games. Rocksteady’s Arkham franchise gained immediate success as it made itself feel like a true Batman adventure, yet stands on its own and provided plenty of fan service. It even got a prequel in Arkham Origins (and yes, it is canon), albeit made by a different studio. With its great mix of combat, stealth, puzzles and easter eggs, it has all come to Arkham Knight. Batman: Arkham Knight keeps all the essential elements of the previous titles and cranks them up by letting you loose in the open world of Gotham. Putting you in a new shiny suit and the virtually unstoppable Batmobile adds an entirely new dimension to game. 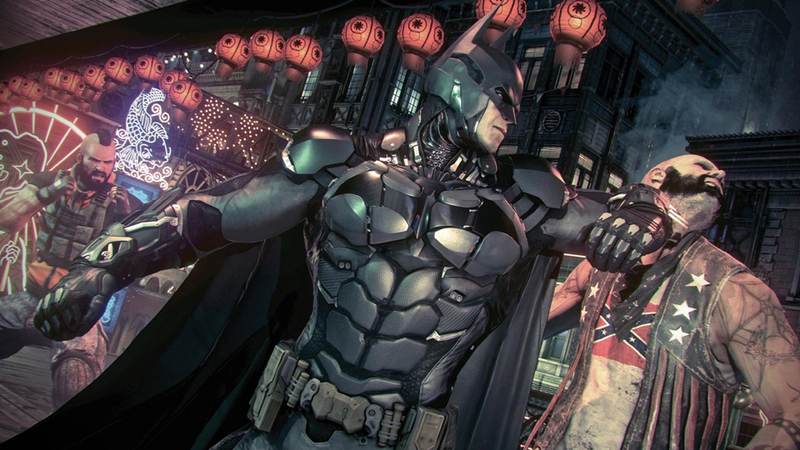 With countless enemies to face and new tools, Arkham Knight is truly a standout. Taking place nine months after the events of Arkham City, the death of the Joker has left Gotham in an eerie state of peace. Crime has dropped and most of the other rogues have been quiet. But it all changes when Scarecrow threatens the city with his new potent fear toxin. He’s not alone; he’s created an alliance with some of Gotham’s most fearsome villains including the Penguin, Harley Quinn, Two-Face and the Riddler. There’s also the new and mysterious Arkham Knight who commands an army of soldiers and drone tanks, and he has a personal vendetta with Batman. With the odds stacked against him more than ever, Batman faces his most daunting task yet. His whip is better than yours. The basic trio of Arkham game mechanics are still here—combat, stealth and puzzles—and they continue to shine. If you think this makes it repetitive, then you thought wrong. Rocksteady has created tons of new enemy types such as the medic who can revive downed enemies and electrify them, or the new combination of brutes equipped with shields and swords. Controls remain the same as in previous entries, with the biggest changes being the new batsuit, dual-teaming and the Batmobile. The Batsuit v8.09 allows you to grapple boost higher and glide further over the skies of Gotham. It also introduces the new fear takedowns, which can be used to wipe out multiple enemies in one sequence. Dual-teaming allows you to briefly take control of a few of Batman’s allies in combat and stealth scenarios for some tag team action. The redesigned Batmobile introduces a new driving element but also expands the puzzles, combat and yes, stealth. (You read that right.) There are times when it seems forced upon you, but I personally didn’t find it much of an issue. The game does have a few small bugs (on the PS4), mostly with enemies phasing through walls and floors, or even teleporting to different areas which can cause problems when defeating all enemies is needed to progress. The game is absolutely gorgeous. Gotham city really pops with its vibrant neon lights and colors over a dark and dim base. The graphical power of the PS4 really makes it that much better. You can see why it went through so many delays and how Rocksteady truly took time to make it look great. The designs of characters both old and new all fit perfectly with the aesthetics of the setting. With this being the first time you can truly see Gotham, the inspirations from past Batman iterations are evident, ranging from the animated series to even Joel Schumacher’s films. Rocksteady has truly found a great blend of mixing old and new without making it feel like the same old and veering too far. With the classic Arkham formula married with new elements of the Batmobile, new suit capabilities and a plethora of enemy and combat types, the game strays from feeling repetitive and stale. The great story and a very surprising cameo makes Batman: Arkham Knight a must have for the summer and all Batman fans. Did you feel the Batmobile was forced or did you love smashing through the streets? Tweet me @NuhUhFuckDat. And be sure you follow us @YouNerded. *This review of Batman: Arkham Knight is based on playing a retail copy of the game on the PlayStation 4 console. DeAndre Hoover is a writer at Younerded.com. That light-skinned guy with the Afro and glasses. Need a seat filler for your next event? Follow me @NuhUhFuckDat. It's time to jam!